सिल्वर स्प्रिङ्ग, मेरील्यान्ड, संयुक्त राज्य अमेरिका. ↑ Paull, John (2013) "The Rachel Carson Letters and the Making of Silent Spring", Sage Open, 3(July): 1–12. ↑ Carson, Rachel (2010 संस्करण). Encyclopædia Britannica. 2010. 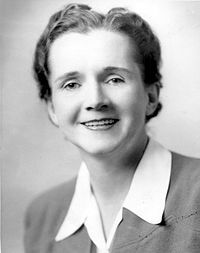 "in full Rachel Louise Carson born May 27, 1907, Springdale, Pa., U.S. died April 14, 1964, Silver Spring, Md." ↑ "National Book Awards – 1952". National Book Foundation. Retrieved March 19, 2012.